We would strongly recommend that potential purchasers of Wild Apricot service review some of Wild Apricot’s online help pages before committing to developing their next site there. It just makes sense to get an idea of how to use the online help pages, because at some point you are going to need them; and it can give you a sense of where limitations may be with Wild Apricot, particularly in how the software may mesh with the assumptions that may be made by your organization. Some diligence only makes sense. 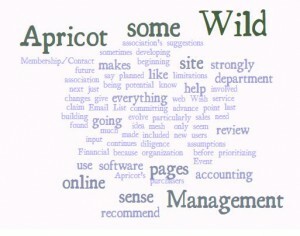 No software can do everything – and Wild Apricot doesn’t claim to. But it does so much that it might seem like it can do everything. It continues to evolve, and users have a say in prioritizing future changes with their Wish List. 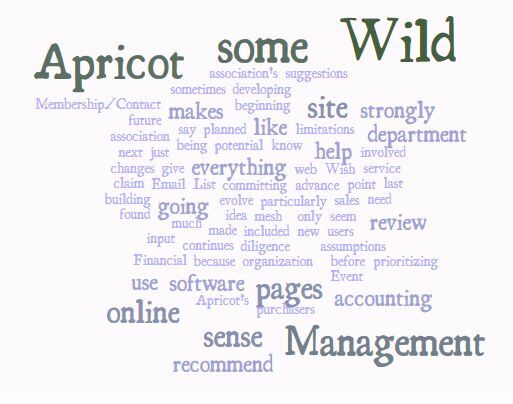 We would strongly recommend that an association have their accounting department have some input on how they would like to use Wild Apricot. We have sometimes found that the accounting department is last to know what is being planned with an association’s web site – but if online sales are going to be involved, they should be included from the beginning.